Thanks to all who commented on my previous post - it is so nice to be in Blogland again. 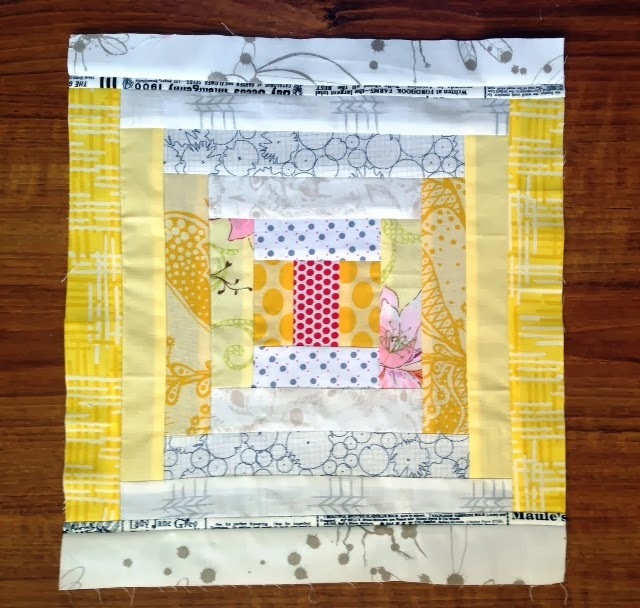 We have QuiltWest coming up in a few weeks and Sweetie, Cat Connelly long arm quilted this quilt. Dear friend Robin stitched the binding on by machine, so now for me to finish. I am not going to answer any phone calls or door knocks (lol!) so here's to a busy day. Trying to post the easy way ... is there one? The Title is there and the Signature is there - and a pic is there - yay! So much has happened in my life - I've been on a downward spiral as a carer for so long. Things haven't changed - well, maybe my determination to try to regain who I am has. I was fortunate enough to be able to squeeze in a trip to Melbourne recently - beautiful rellies made my trip so peaceful, relaxing and enjoyable. I squeezed in a trip to the quilt show and a lovely few days in the Highlands of Victoria. 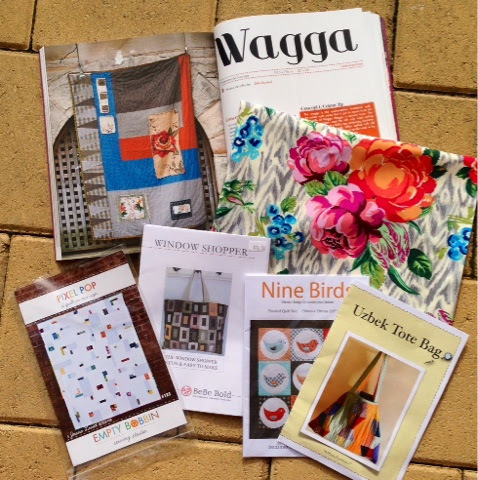 I did come home with goodies - books, patterns and fabric of course! I met the delightful Kathy Doughty in person - now that was a buzz as we have been in touch for many years. 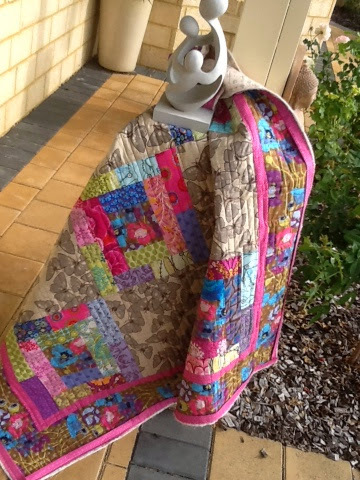 I already owned her book, so here is a beautiful accent floral - have some lovely fabrics to make a Wagga! I was thrilled to receive this book yesterday and the fabric earlier in the week - both tell you a little about themselves. After I have finished piecing my Courthouse Steps, I really want to see if I can create an improv quilt for DS's birthday next year. As much as I love modern, can I live with wonky? I feel sure Lucie's book will help in the confidence area - a gorgeous book! This soft coral of the fabric is my favourite hue at the moment and Art Gallery, my very favourite line of fabric for feel, beautifully fine and soft. Blogger - well, could talk for an hour on that. Time is too precious these days for the time the old way takes, so I have chosen the quick, practical, alternative. I will try to find the info to present more attractive posts, even if it is in bed late at night. For now - happy stitching - Lurline! Nice to be back again so soon! Here is the little progress I have made on this project. An oldie but a cutie published in DUQ - even in those days I loved bright, fresh moderns! Now this is my recent choices - a courthouse steps block inspired by Molly Flanders and Purl Bee - let's hope it grows into a lap quilt that I have quilted with Perle thread. ... and I have missed you, My Lovelies! I lead a very busy life these days and family needs have been great. I guess that will continue to be as Mother is now 95 and needs a lot of care and Hubby is 74 with quite a lot of health issues. I must say I had lost my mojo - I think that happens to a lot of us from time to time - but I must say it is back with a vengeance also! Above, just a little Sneak Peek showing you the wonderful Clover binding clips, no more little blood spots on my new quilts. 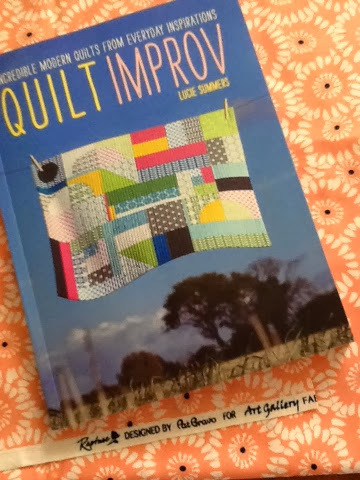 My next project - it is going to be an Improv quilt. Here are my starter fabrics, just love the combo and I think I will add quite a few solids. 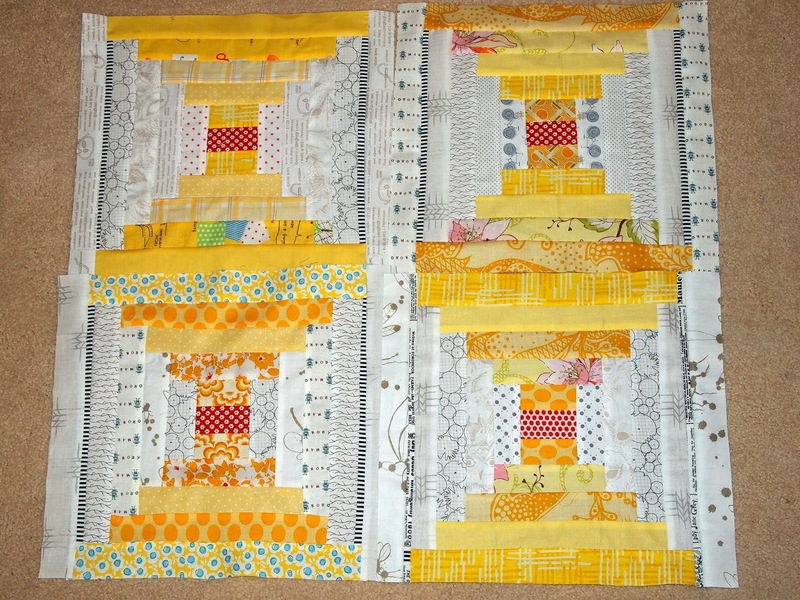 It will be a Topsy Quilt and just grow, should be fun and let's hope a success too, lol! After much deliberation this new baby has come into the home. I do have a wonderful Janome Memorycraft 6600 which is on the market. I have owned a Pfaff previously and love my Janome but with the prosthesis in my left shoulder, was having difficulty attaching the quilting foot. Both have built in scissors, which I find are such a blessing, so it will be interesting to see if I have made the right decision. Here's baby Nate, now 5 months - missing him heaps, but I get to see him on Skype and I know it will not be too long until I see him again. 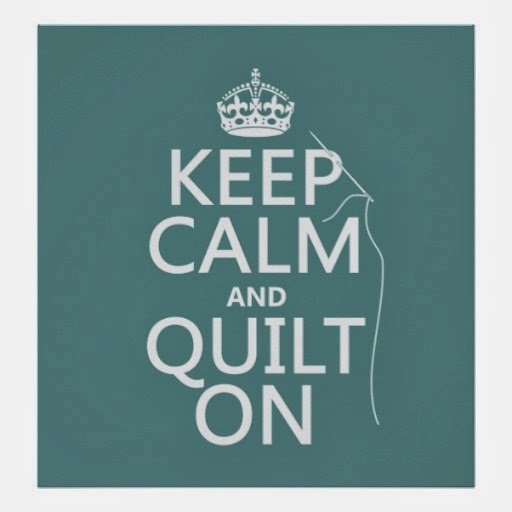 Hope you are all enjoying your weekend stitching or partying - this time of year seems to come around so quickly, so have fun! Top pic is my contribution to our Creative Threads group who are organizing a raffle basket for Pink Month in support of Breast Cancer Awareness. I'm happy as with the Makeup Pouch from a tutorial by Flossie Teacakes - also donating a few fat quarters of pink solids. 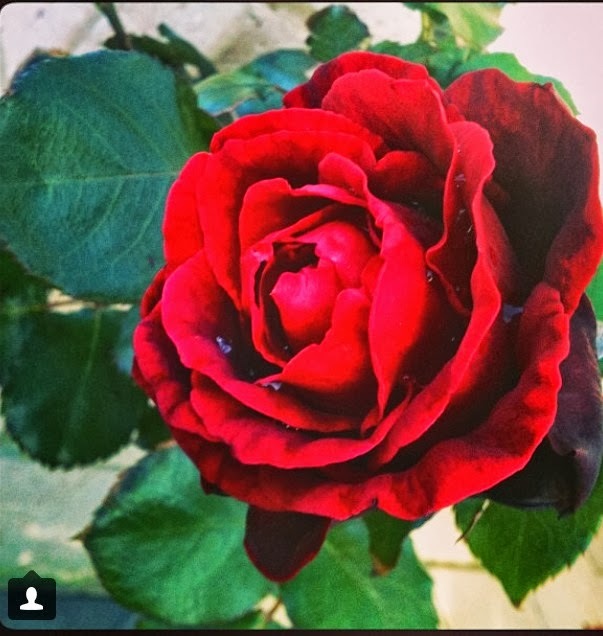 DD, Danielle, has been Instagramming my roses again - this one a climber Don Juan. She gets so much fun out of taking pics here, there and everywhere, and of course I love being the recipient of her work. Off to make a start making dinner, then checking out my home made recipe for fungus on roses - hope it works! Happy Day everyone - sorry about the messy Post! I did promise myself I would post daily for a week - no! hasn't happened. I've got lots of really good excuses, but let's get on with this Post! 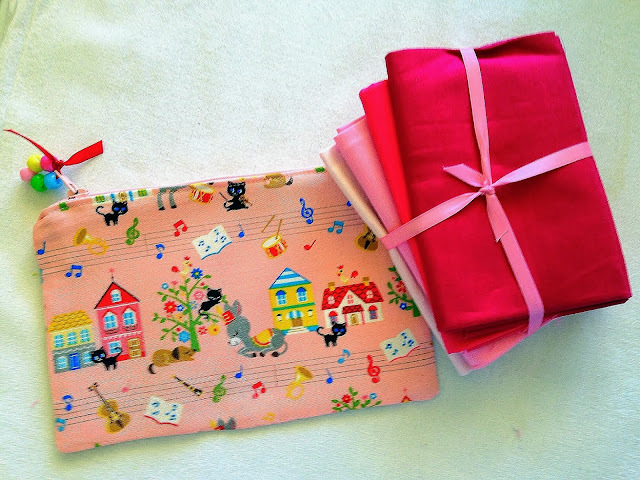 Less than an hour ago a lovely parcel arrived at my door thanks to Fabric Patch in Queensland. As you probably know, I'm in Western Australia and I can't say enough about those great girls on the hinterland of the Sunshine Coast. Do have a little browse of their site at some time. This book really took my fancy and as I am thrilled with it and the ruler - should make life easier! I wish I had time right now to get to the sewing room. 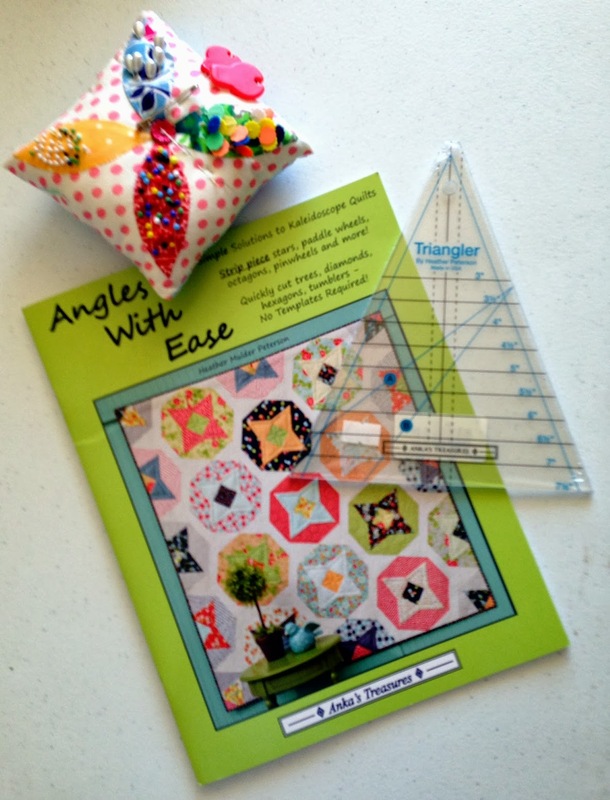 The book has really great modern patterns, yes, some a little wonky which I love! Oh, see the new little pincushion I have made myself out of a little orphan block - my other one has gone missing, I'm sure it will come out of hiding one day. Another pic of my gorgeous Brass Band - DD who does Instagram beautifully told me my last pic was boring - oh well! Happy stitching girls, we have beautiful sunshine here at long last must savour it while we can - should pop out and talk to my roses, lol!